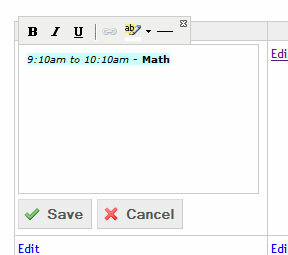 When using PlanbookEdu there are two ways to edit your plans, using the more thorough Edit feature or Quick Edit. The first option is to click the "edit" link in the box which opens a new window. The second method is to use our quick edit feature. To quick edit a box simply double click in it. When using quick edit mode there isn't as much as space, so we had to limit the options that are available. First there is no option to set the entry to repeat. All quick edits are "one time" entries. Even if you are editing a "daily" or "weekly" entry it will automatically become a "one time" entry. This is great if you are working with a lesson plan template. Also missing is the ability to set the Common Core Standards or attach files. If you need to set these options you'll need to click the "edit" link to get the full edit window. 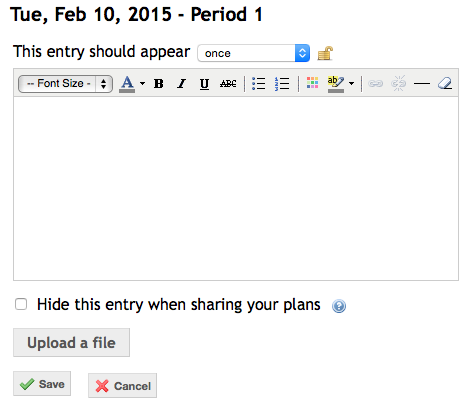 You can quick edit many entries at once, which is great for when you're deep in a lesson planning zone. Just make sure to click "Save" on all of them before you leave the page!